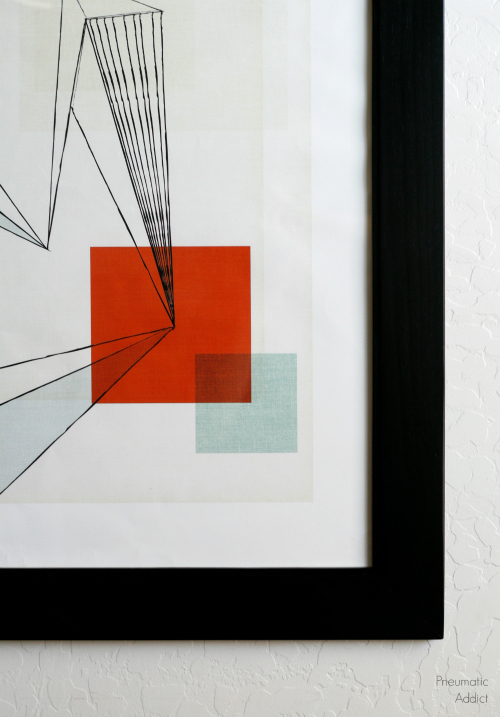 A few months ago I got a couple of gorgeous art prints from Minted. 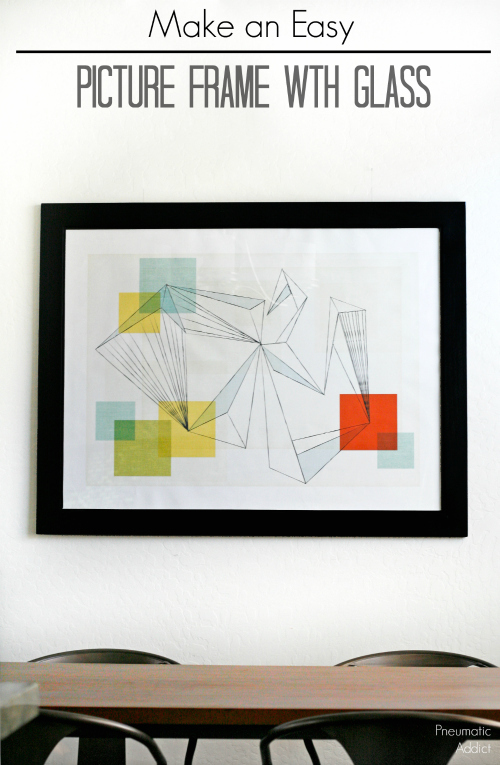 The first one I created a frameless, floating mount for and hung it in my bedroom. The second print, is massive! (30" x 40") And sat under my bed until I came up with an equally huge frame. There was no way I was going to pay the money for a custom frame, so I decided to make a real, high quality frame myself. I found a few different tutorials for making a large picture frame, but I wasn't satisfied with any of them. Either they were built too flimsy, required special tools (like a router), or didn't accommodate a sheet of real glass. I'm really happy with the solution I came up with. It was easy to build, sturdy, and is a full fledged frame, with a groove for a heavy sheet of glass. 1. The first step is to cut and miter the main boards down to size. 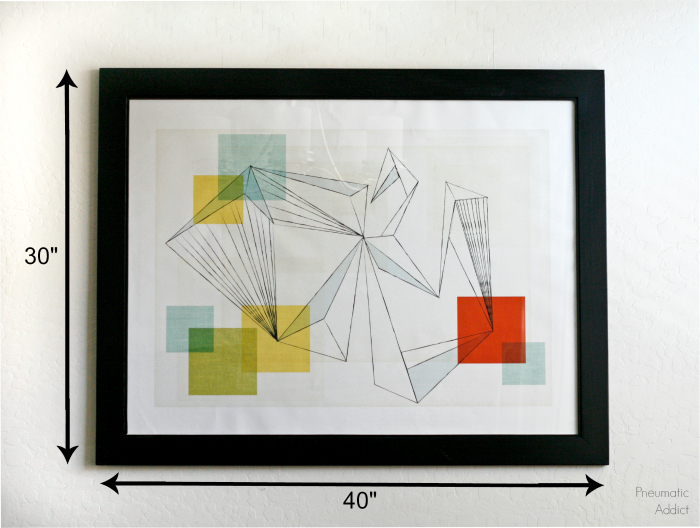 The actual length will depend on the size of art print you're framing. All four boards get a 45 degree cut on both ends. You want the short sides of the boards to match the length and width of the art (ie. If your print is 8 x 10, you want two boards at 8" short side to short side, and two boards at 10" short side to short side). 2. Drill two 3/4" pocket holes, on the diagonal ends of each board. 3. Brush wood glue on the mitered sides and align the corners of the frame. 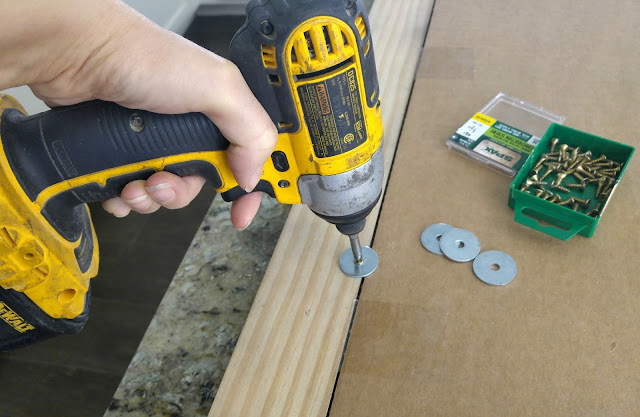 Clamp the boards together on a flat work surface and drive two 1-1/4" pocket hole screws. 4. With the basic frame built, there needs to be a groove for the glass, print, and backer panel to sit in. 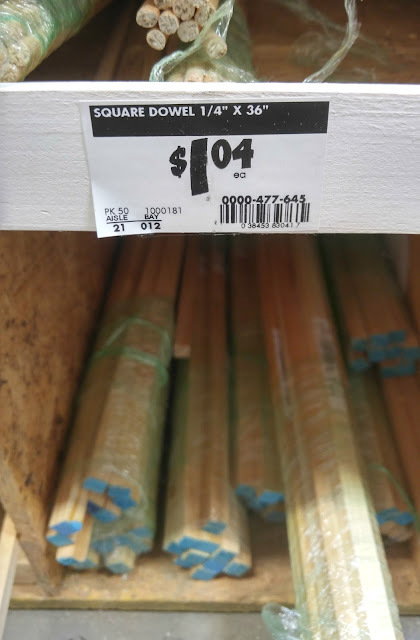 You can find 1/4" square dowels on low shelves in the moulding aisle at Home Depot. 5. Measure the inside of the frame and cut and miter the dowels to fit. Space the dowels, allowing a 1/4" deep space on the backside of the frame. If you are using 3/4" stock for the frame, the dowels should be placed in the center of the inside edge. 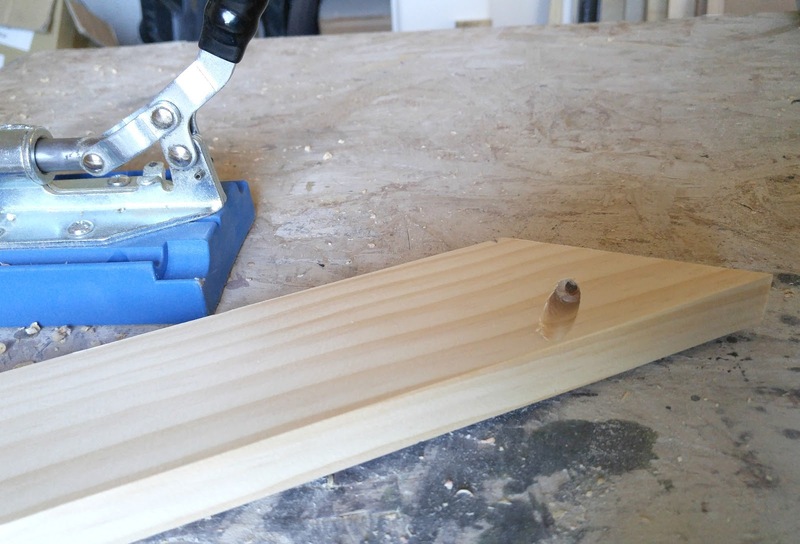 Apply glue and clamp the dowels in place while they dry. 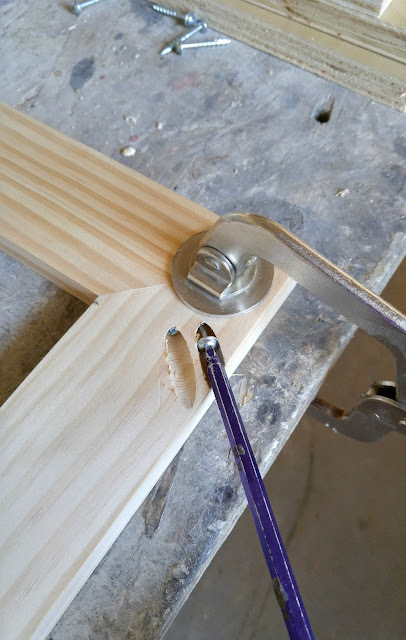 If you have a 23 gauge pin nailer, you could tack the dowel in place, but I wouldn't recommend 18 gauge brads (they'll blow the delicate wood apart). 6. 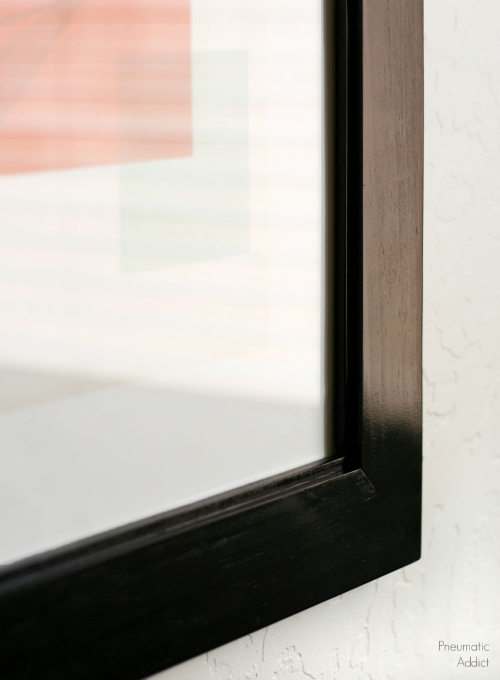 Once the glue is fully dry, you can paint or stain the frame anyway you'd like. Normally I'd cut the glass myself, like I did with my kitchen cabinets, but Home Depot and Lowe's don't sell glass sheets large enough. I used a 40% off coupon from Hobby Lobby and had a 30" x 40" piece of glass cut for $24. I flipped the frame over and laid the glass, art, and cardboard backer in the groove. Since I didn't have any turn buttons on hand, I used a trick I saw at Remove and Replace. I screwed fender washers on the inside edge of the frame, overlapping the backer panel slightly. It holds everything snugly in place and can be easily unscrewed if anything needs to be replaced. 7. 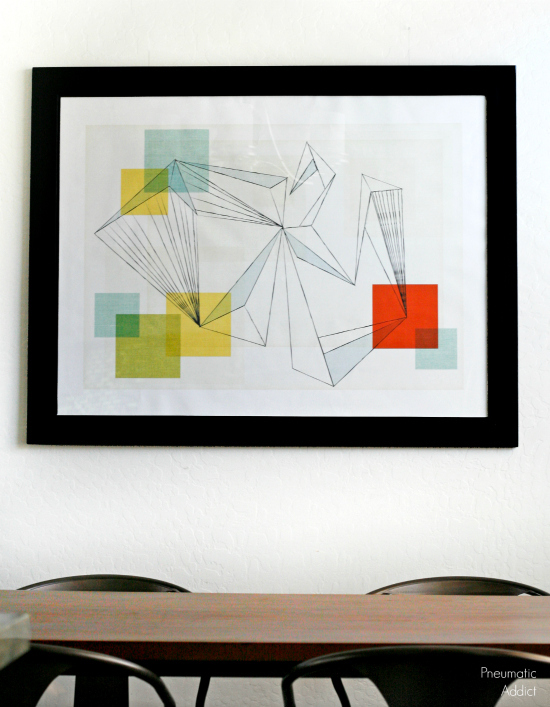 I screwed a pair of sawtooth hangers to the backside of the frame and hung my new art on the wall. I really like the extra detail the 1/4" dowel adds to the inside of the frame. You could always align the trim to the outside face and fill the seam with wood filler if you wanted a totally smooth profile. With the glass, this frame cost me around $50 to make. WAY less than I would have paid for a solid wood, custom frame this size. This frame could be made in any size! 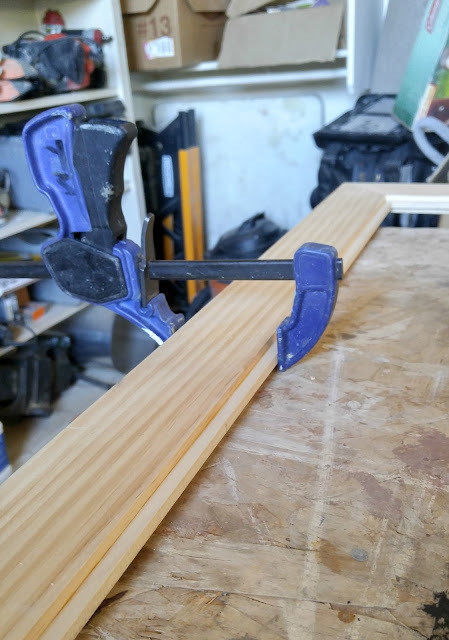 I made mine huge, but you could use this technique to make a smaller frame too. Ready to get building? Pin the image below to save the idea for later. How I wish I can be as handy as you, I am afraid of saw and any cutting machine especially I have children around the house. But I definitely adore your finished projects, very creative and productive not like the ones I got from ninja essays which lacks creativity and resourcefulness.